Homemade pizza is easy to make and can be so much healthier than what you order for take out. Using store-bought whole wheat dough makes preparing this dish really easy. Experiment with toppings based on what you have on hand. Roll dough into a 14-16 inch circle on a lightly floured surface. Place the dough on a pizza pan or baking sheet coated with cooking spray and sprinkled with cornmeal. Heat oil in a large non-stick skillet over medium heat. 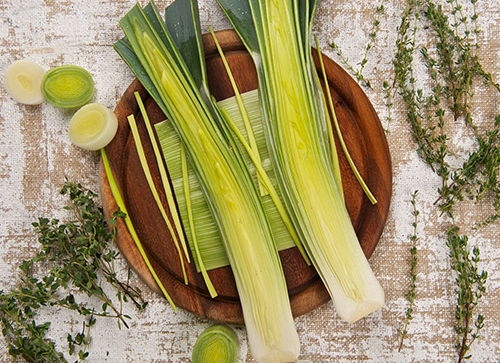 Add leek. Saute for 10 minutes until softened and lightly browned. Cool to room temperature. Combine cheeses, pepper, and garlic in a bowl. Spread the cheese mixture over the pizza crust, leaving a 1-inch border. Top with the leek mixture, and sprinkle with walnuts. 5. Bake for 15 minutes, or until lightly browned. Cut into 8 wedges.